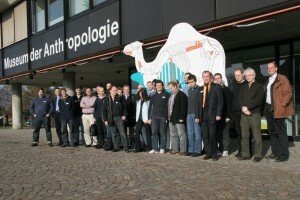 The first Forum of the hpc-ch community has been a great success with 10 presentations and more than 30 participants. We have been welcomed by the University of Zurich, Christian Bolliger, Alexander Godknecht and the designated vice president for research, Prof. Daniel Wyler. During the lunch break we had a group picture in front of a dromedary (the animal has no additional relation to our meeting :-). During the meeting we had a special session about the hpc-ch community. The most important outcomes are listed here below. We had a longer discussion about the number of Forums in a year and what the best dates are. The common opinion was that two meetings a year would be a good starting point. We decided to have “independent” dates not related to a conference. This would allow us to have site visits at the hosting organizations. Thursday, Mai 20, 2010 on Operating Systems for HPC and installation methods, hosted by EPF Lausanne. On the evening of Mai 19 there will be a hpc-ch networking dinner in Lausanne. The board of hpc-ch will be composed by a representative of each member organization. Every organization can also appoint one or more deputies. The board members are in charge to select the topics of the Forum and they recruit participants to Forums in their own organization (the invitations to Forums are posted on the blog and send to the representatives and their deputies by e-mails). The members are welcome to put a link to www.hpc-ch.org on their web pages. Some important organizations providing HPC services in Switzerland (e.g. EMPA or University of Lausanne) are still missing as members. Please send the names of possible contact persons to mdl. Send change requests of the list with the organization representatives and deputies to mdl. Please post additional remarks to these minutes as comments.